Is DaVita Inc (NYSE:DVA) a good stock to buy right now? We at Insider Monkey like to examine what billionaires and hedge funds think of a company before doing days of research on it. Given their 2 and 20 payment structure, hedge funds have more incentives and resources than the average investor. The funds have access to expert networks and get tips from industry insiders. They also have numerous Ivy League graduates and MBAs. Like everyone else, hedge funds perform miserably at times, but their consensus picks have historically outperformed the market after risk adjustments. DaVita Inc (NYSE:DVA) has experienced a decrease in support from the world’s most elite money managers of late. Our calculations also showed that DVA isn’t among the 30 most popular stocks among hedge funds. We’re going to review the recent hedge fund action surrounding DaVita Inc (NYSE:DVA). Heading into the first quarter of 2019, a total of 39 of the hedge funds tracked by Insider Monkey were bullish on this stock, a change of -7% from the previous quarter. 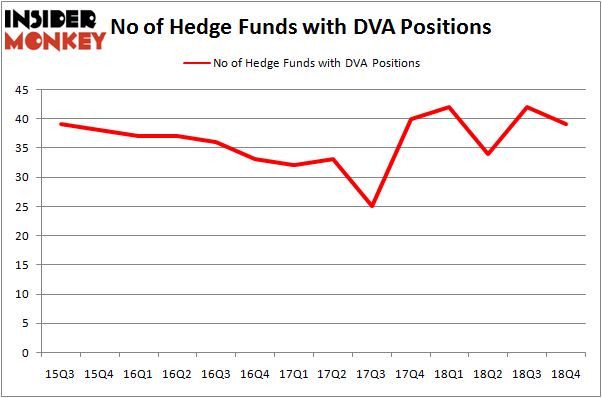 On the other hand, there were a total of 42 hedge funds with a bullish position in DVA a year ago. So, let’s review which hedge funds were among the top holders of the stock and which hedge funds were making big moves. According to Insider Monkey’s hedge fund database, Berkshire Hathaway, managed by Warren Buffett, holds the most valuable position in DaVita Inc (NYSE:DVA). Berkshire Hathaway has a $1.9846 billion position in the stock, comprising 1.1% of its 13F portfolio. The second largest stake is held by Andreas Halvorsen of Viking Global, with a $134.3 million position; the fund has 0.8% of its 13F portfolio invested in the stock. Other hedge funds and institutional investors that hold long positions encompass Michael A. Price and Amos Meron’s Empyrean Capital Partners, Jeffrey Gates’s Gates Capital Management and Paul Reeder and Edward Shapiro’s PAR Capital Management. Judging by the fact that DaVita Inc (NYSE:DVA) has witnessed a decline in interest from the aggregate hedge fund industry, it’s safe to say that there lies a certain “tier” of hedge funds that slashed their entire stakes last quarter. Interestingly, Jim Simons’s Renaissance Technologies dumped the largest stake of all the hedgies watched by Insider Monkey, comprising about $45.5 million in stock, and John W. Rende’s Copernicus Capital Management was right behind this move, as the fund said goodbye to about $12.6 million worth. These bearish behaviors are intriguing to say the least, as total hedge fund interest was cut by 3 funds last quarter. Let’s go over hedge fund activity in other stocks similar to DaVita Inc (NYSE:DVA). These stocks are Goldcorp Inc. (NYSE:GG), Vail Resorts, Inc. (NYSE:MTN), Huazhu Group Limited (NASDAQ:HTHT), and BeiGene, Ltd. (NASDAQ:BGNE). This group of stocks’ market caps match DVA’s market cap. As you can see these stocks had an average of 20 hedge funds with bullish positions and the average amount invested in these stocks was $710 million. That figure was $3002 million in DVA’s case. Vail Resorts, Inc. (NYSE:MTN) is the most popular stock in this table. On the other hand Huazhu Group Limited (NASDAQ:HTHT) is the least popular one with only 15 bullish hedge fund positions. Compared to these stocks DaVita Inc (NYSE:DVA) is more popular among hedge funds. Considering that hedge funds are fond of this stock in relation to its market cap peers, it may be a good idea to analyze it in detail and potentially include it in your portfolio. Our calculations showed that top 15 most popular stocks among hedge funds returned 19.7% through March 15th and outperformed the S&P 500 ETF (SPY) by 6.6 percentage points. Unfortunately DVA wasn’t in this group. Hedge funds that bet on DVA were disappointed as the stock returned 4% and underperformed the market. If you are interested in investing in large cap stocks, you should check out the top 15 hedge fund stocks as 13 of these outperformed the market. Did Hedge Funds Drop The Ball On Kansas City Southern (KSU) ? 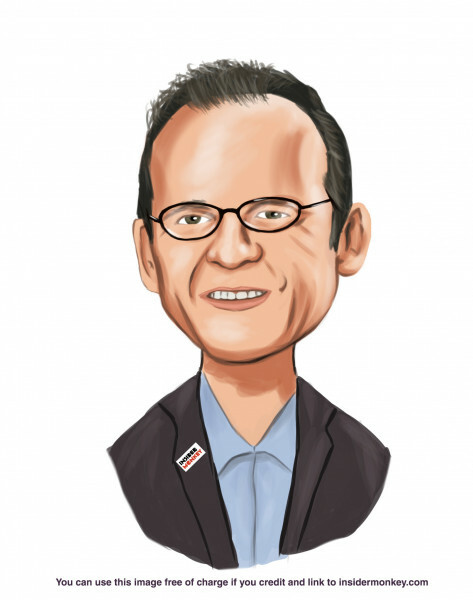 Here is What Hedge Funds Think About Jack Henry & Associates, Inc. (JKHY... Here’s What Hedge Funds Think About IDEX Corporation (IEX) Were Hedge Funds Right About Flocking Into Altice USA, Inc. (ATUS) ? Here’s What Hedge Funds Think About The Gap Inc. (GPS) Were Hedge Funds Right About Souring On WestRock Company (WRK) ?